Hi guys I am in need of help. My 72 510 has BMW disks up front and standard drums at the back. The master cylinders are 3/4''. There is no brake booster very basic system. When I push the brake pedal the pedal is very hard and hardly moves however I can push as hard as I can the brakes do not lock they brake very poorly. Do I need to install a brake booster, installing a brake booster will be very difficult because my engine bay is really full I have no space, the V8 takes up alot of room. By BMW discs up front do you mean calipers and rotors?or just the disc rotors? Did this just suddenly happen? Was this working normally before? Did you just put this combo together and this is the result? Check for brake fluid leaking onto pads or some kind of contamination on the rotors or pads. Were the rotors de-greased before putting them on? Sorry I must add that I have two master cylinders both 3/4 one for front one for back drums. This issue with the hard pedal and poor stopping has always been like this since the brake modification. The Rotors and calipers are both BMW. Dual masters? So you have a balancing bar setup? Same leverage spot as stock? Instead of a booster you could attempt to increase the leverage by changing the pivot point of the brake pedal bar. Unless your front & rear brake slave cylinders use the exact same volume, then you should probably have an articulating balance bar across the master cylinders to account for the force/pressure difference. I would be looking at how those brake slave cylinders (calipers or drum cylinders) were originally set up on their original vehicles. If the BMW calipers had a 3/4" master for the fronts, what were the brake pedal pivot points & length of pedal arm, and did it use a booster? That would at least tell you if you were on the right track towards figuring out a solution. 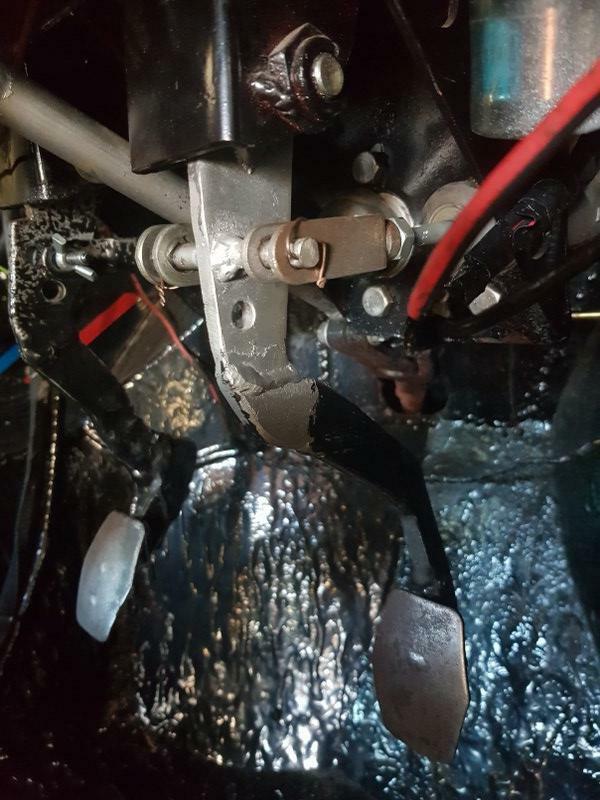 Also, with the masters so far forward, you've bent (cut, welded) the brake pedal arm in such a way that the leverage you physically have over the master cylinders is very poor - you're practically trying to push (pull) the brake pedal lever away from its pivot, rather than enacting force on the master cylinders. Is the reason for 2 brake masters(one front/one rear) because of lack of room? Is the clutch pedal also hard to push? The clutch pedal is no problem that easy to push. I did not do the modification I bought the Datsun like this. I am trying to make it better. Is it normal not to have a brake booster? So lack of space is the reason for the 2 brake masters, I am not sure how your going to fix this without starting over. It appears to me you have a leverage issue, too me it looks like the brake master rods need to be closer to the pivot point of the pedal. 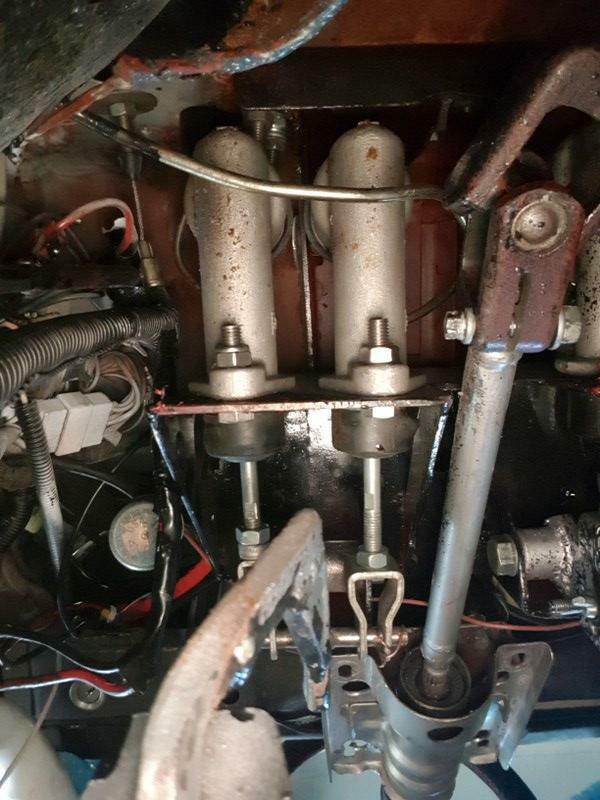 If you cannot get what you have working, you might be able to get something like this to work, search 90 degree under dash brake pedal on ebay or in a general search, here are a couple links to what I am talking about, you need one that pivots away from the clutch pedal. You also look at another way, it appears your car is left hand drive but I cannot tell for sure, my question would be how much room you have farther to the side towards the inner fender or on the other side? 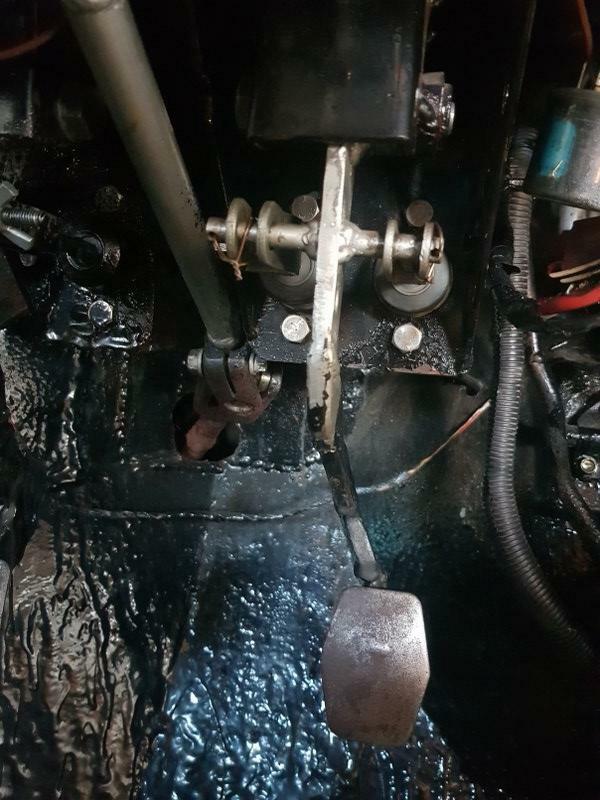 My RHD classic Mini has the brake master on the left side in the engine compartment, it has a rod mounted right on the firewall that goes all the way over to the left hand side of the engine compartment and the brake booster/master is on that side where there is room over the clutch cover, it's just a thought. I dont know if a brake booster will fix this. 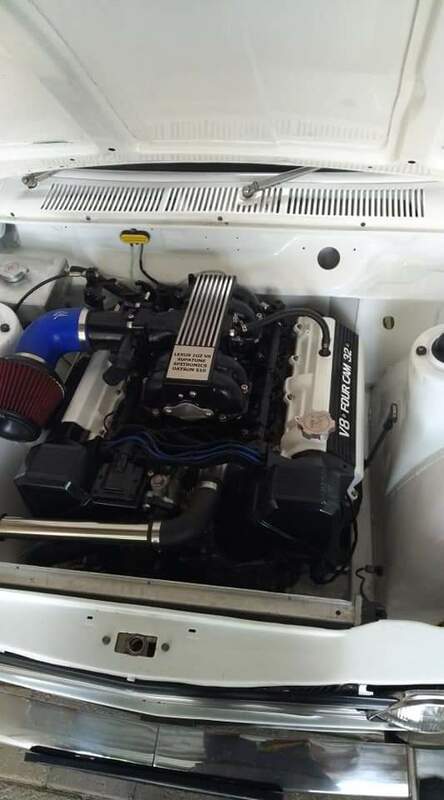 It's a 510 with a V8 already in it in Cape Town South Africa. I think it is a LHD because I can see the steering column going to a hard left thru the firewall, if it was RHD I would have expected the column to go to the right. A clear photo of the engine compartment would likely help to answer a lot of questions. I suspect all this was done by the former owner as he says he bought it this way, I also suspect this is why the former owner sold it. Here is another setup I found, this type is actually being used in this 510 in the photo below, it also has one clutch and 2 brake masters, but it has been made this way for this purpose not cobbled together in someones garage or driveway. There are lots of different types and styles of this pedal assembly in the link below, just search the net for them using "2-Pedal Assembly Overhung Mount". As I already said, he is likely going to have to start over, this is why I am suggesting other ways other than trying to fix what he has, I just don't see what he has working unless he starts over, and the pedal assembly in the link above is complete with pedal arms. So an update. The Datsun is a RHD, I check the levels on the master cylinders with difficult but its possible. I got a remote brake booster from a BMW 3 series its nice an compact cost me 2000 rand which is about 120USD it was an overhauled unit. 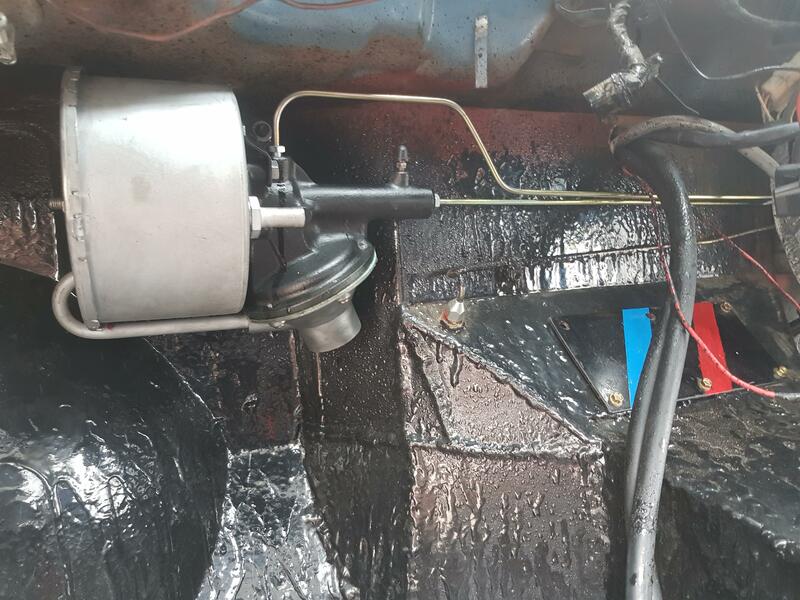 The booster is only connected to the front brakes and now works really well. The foot pedal travels a bit to far but I think I just need to do some adjustments. I installed the booster in the passenger side foot well because there is no space in the engine bay. The photo was taken with the vacuum hose off because I was still trying to find the right hose. I still have not found the correct type of hose, for now I am using a garden hose but I am not showing a photo of that. This is a photo of the engine bay.